Devoid Of Culture And Indifferent To The Arts: Gardening: Signs of Spring. The Cucumber Magnolia is stirring! Gardening: Signs of Spring. The Cucumber Magnolia is stirring! This is a nearly opened bud from 2008. The tree will be covered this year. I was out stomping around in the melting snow on the weekend. What a difference a week makes. Seven days ago a -16°F deep freeze, this week's forecast is for the positive double digits. So it was with great interest that I snooped around to see how the plants, bushes and trees fared since the Fall. I was pleasantly surprised with what I found. It appears that this will be a great year for Rhodos, as well as magnolias. 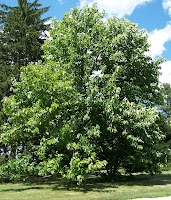 One tree that may be of interest to you is our Cucumber Magnolia. It is literally covered with buds. What, you say you've never heard of it? Well, no wonder, as it's less about the flowers as it is the tree itself and the Fall display of seeds. The usual culprits for Magnolias in the garden tend to the flashy, big flowered varieties. I'm glad that I purchased this one when I found it. At the start it had two lead stems, of which one broke off and I thought I was going to loose it. I should have known and removed one to start with. After the loss it struggled a little, but has now settled in comfortably and is a happy as a lark. 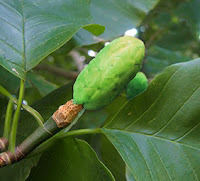 The Cucumber Magnolia (Magnolia acuminata) is a Canadian native of the magnolia family and is hardy to zone 5. 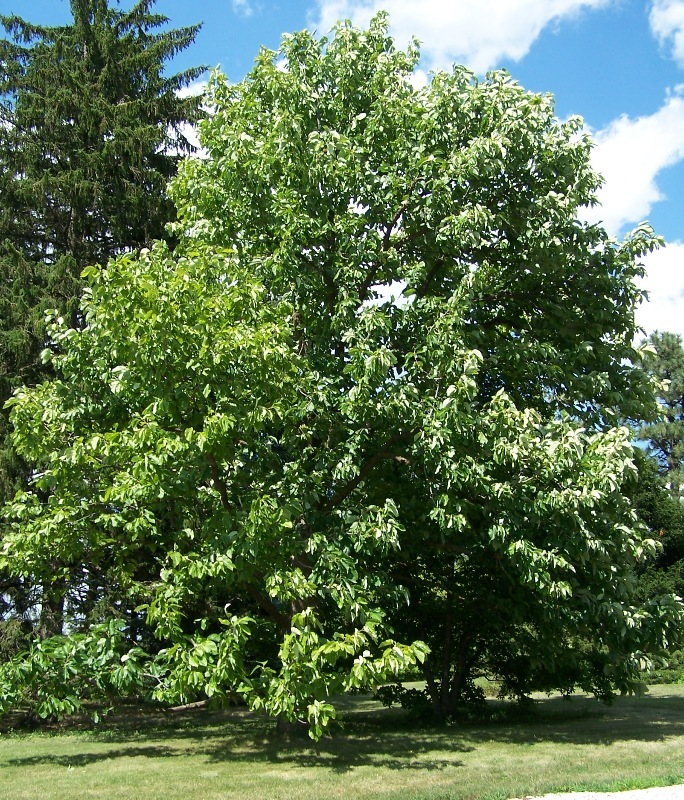 It grows into a large shade tree with a beautiful conical shape. The leaves are large, 10" (25 cm) leaves but the medium-sized flowers are of less interest, being greenish-yellow-blue, but quite fragrant. They're sort of cinnamon scented. 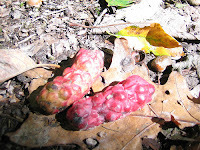 Its real beauty is best enjoyed in late summer and fall, when the seed pods develop. It forms big, red, bumpy long pods with slits from which bright orange seeds pop out. The seed pods are where this interesting specimen derives its name. When you smell the seed and pods you are greeted with the fragrance of spices. It's worth growing for that spectacle alone. This unusual tree will bring a unique character to your garden. It has the potential to become quite a tree, reaching a potential height of 60' and a width of 20'. Thank goodness I planted it where I did. Don't be put off by the flowers. I think they do have their own beauty, and I can't wait for early Autumn when those seeds develop. I may get some enjoyment out of this Spring as well. With the number of flower buds that are swelling as I write, it will probably be enough to scent the air as Spring breezes waft through its branches. Spring is on its way, folks. There's no turning back now!